I would like to order the 6.5oz bags of yellow rice dinner but it is not listed. How can I purchase this? Go to the “where to buy tab” click Online ordering and it will take you to the online website http://www.southerntraditionalfoods.com. You can also call Max Reed @ 251-213-1171 for all online ordering questions. You can also find this item at most grocery stores all through the South East. I bought 2 10 oz packages of the yellow rice dinner packages at the Winn Dixie Store in Inverness, Fl….Had company ,, for dinner,, started to fix the rice, one of the packages was missing a flavor pack..Good thing I bought 2 packages,, little disappointed..the finished product wasn’t very good,. rather bland..
flavor pack,,good thing i bout the 2 packs .. haf company over for dinner,, the finished dinner wasn’t too good rather bland. Also having trouble finding this. Best yellow rice ever. I live in the Apollo Beach, Riverview, Brandon Florida area. Where can I buy this locally? I used to buy it at Winn-Dixie but they don’t seem to carry it anymore… Not happy about that! Thank you so much for contacting us. 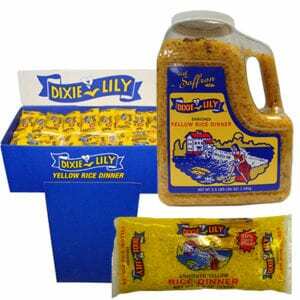 Unfortunately, Winn-Dixie has discontinued our yellow rice dinner. It was a very sad day to see this item be discontinued at Winn-Dixie. Please complain to the store manager next time that you are in there. 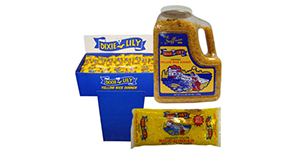 The closest store that carries our yellow rice dinner is Felton’s on N. Maryland Ave. in Plant City. Their phone number is (813) 752-1548. We hope this helps and we appreciate your business. Thank you so much for contacting us. We are sorry that you are having trouble finding our yellow rice. Please complain to your Winn Dixie store manager that you do not see our product. In the mean time, you can find our yellow rice dinner at Bravo Supermarkets in Fort Myers. If you can’t find it at Bravos you can always buy it online in bulk (Twelve, 10 oz. packets) on Amazon or you can buy it individually at https://southerntraditionalfoods.com/. We appreciate your business and we hope this helps.